Clearance distances for a B-vent to combustible materials in floors, walls, ceilings, attics, roofs. This article series describes B-vent metal chimneys used for gas-fired appliances. 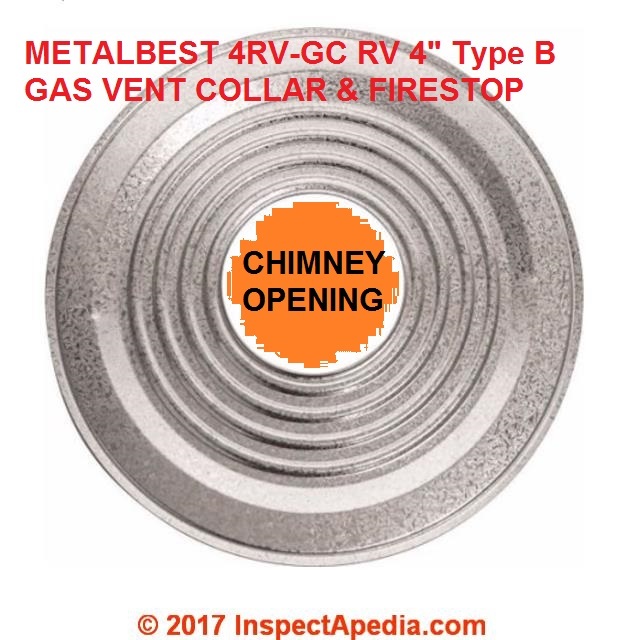 We discuss fire safety, fire clearances, and other gas appliance venting details for b-vent chimneys. 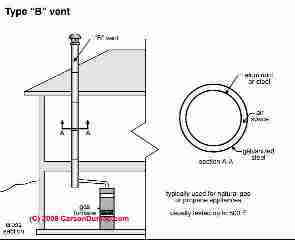 Ceiling, Wall & Wall Clearances for B-Vent "flue pipes"
Type B-vents are double-walled metal chimneys/flues and can be used only with listed, draft-hood equipped gas appliances. A Type B vent is intended for relatively low-heat applications. B-vents are not permitted for use with incinerators and are not intended for use with appliances burning anything other than LP or natural gas. All vertical penetrations where the vent passes through a combustible floor, ceiling or roof, require a Fire Stop (p/n 5x18CI) or Roof Jack be installed. Horizontal systems passing through a combustible wall require the use of a Wall Penetration, for relative temperatures with clearances. See Table 1 for proper framing dimensions and refer to Wall Penetration section for installation instructions. 1) If a ceiling or wall has a fire resistance rating and is penetrated by a Models G, PS, or IPS Grease Duct, then the duct shall be enclosed with a continuous enclosure extending from the penetration, through any concealed spaces, to or through the roof so as to maintain the integrity of the fire separations required by the applicable building code. NOTE: If penetrated by Z3 or Z4 no additional enclosure is required however the appropriate Through Penetration Firestop (TPF) must be used. See Through Penetration Section. 2) If a ceiling or wall does not have a fire resistance rating and is penetrated by a Model G, PS or IPS Grease Duct installed at the correct minimum clearance for unenclosed duct, then no enclosure is required. 3) Where the Model G, PS and IPS ducting extends through any story of a commercial building above that in which the connected appliances are located, it must be enclosed in the upper stories with walls having a fire resistance rating of not less than one hour for buildings of two or three stories in height. Question: For a propane furnace flue pipe how much clearance is needed through ceiling area? For a flue pipe from a propane furnace how much clearance is needed as it goes through ceiling area? Can one put in metal mesh to prevent insects or critters from coming down from the attic? 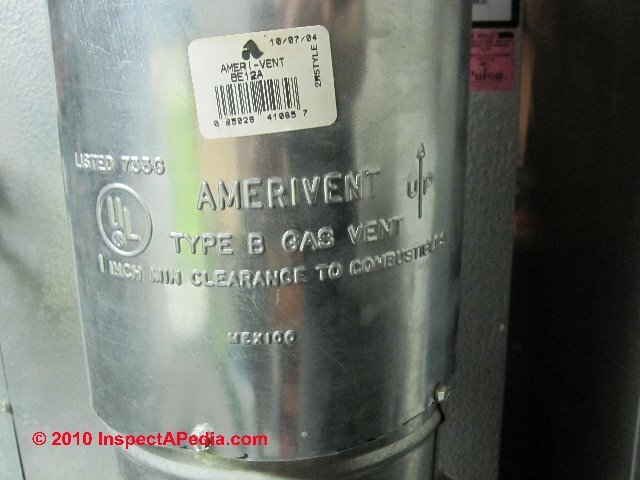 [Click to enlarge any image] You'll see that the manufacturer, Amerivent has stamped this Type B gas vent as requiring 1" clearance to combustibles. If you are using a "zero-clearance" insulated chimney such as CLASS A CHIMNEYS, MetalBestos™ the product label might it for zero clearance - or rated for in-contact with combustibles. However a review of contemporary insulated chimneys such as the SuperVent and SuperPro by Selkirk frequrenly require a 2" fire clearance around most penetrations through building walls, floors, ceilings, roofs, unless the wall or floor is made of noncombustible material (like concrete). 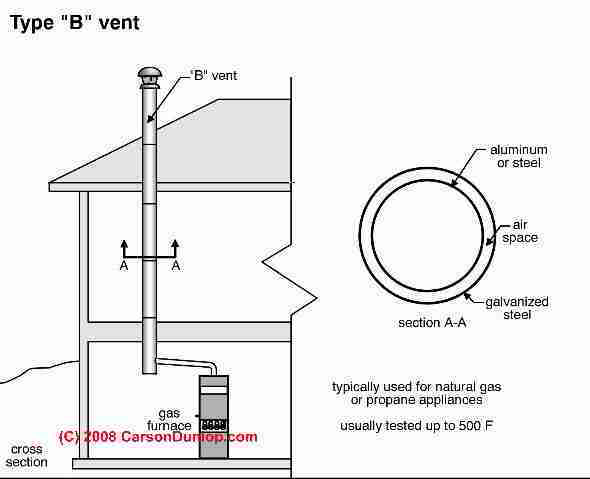 As you've read above, a B-vent is the proper venting connection between a conventional LP gas or natural gas heating appliance and the outdoors. Occasionally we find an older installation of a gas fired heater that uses a single-wall metal flue between the appliance and a masonry chimney: this might be acceptable depending on local codes and restrictions where you live, if proper fire clearance distances are kept. The proper term for this connector is a "flue vent connector" but plenty of normal people use the word "flue" or the phrase "stack pipe" loosely for any sort of chimney or chimney connector. Watch out: a single wall metal flue vent is not safe if it passes through combustible floors, walls, ceilings, roofs. Watch out: You do NOT and should NOT use a home-made insect screen to cover the fire clearance opening. Rather you should buy a UL-Listed (approved for fire safety) Type B Gas Vent collar and firestop such as the MetalBest 104460 Galvanized RV 4" Type B gas vent collar and firstop or such as the MetalBest RV-GC shown in the photo below. The products you use for this application, if you're in North America, should be Tested and Listed to UL1738 & ULC S636. and widely available from your heating and plumbing supplier, building supply stores, and even online at Walmart. Watch out: even using light-weight B-vent chimney sections, the total weight of the chimney extending up through the roof will require support at one or more locations, typically using a ceiling support, attic support, or roof support system provided by the manufacturer. Additional fire blocking and shields are required at each of those passages. Watch out: Keep in mind that a building permit and inspection is usually required for installing a heating appliance and its vent or chimney - something that you might think you won't enjoy but something should ask-for, since the inspection will improve the safety of your home. More details about Type B metal chimney fire clearances indoors can be read at FIRE CLEARANCES, METAL CHIMNEYS. See CHIMNEY CODES for our complete list of online chimney code PDF files. An Attic Insulation Shield must be installed where a chimney passes from a lower living space into an upper living space or into an attic space. It is designed to keep insulation materials from coming into contact with the chimney and will protect up to a 10" (250 mm) thickness of insulation. Where height restrictions will not permit the use of the Attic Insulation Shield, an enclosure from the attic joist to the roof joist will be sufficient. All chimney enclosures must maintain the required minimum air space clearance of 2" (50mm) to the chimney. Continue reading at TYPE B-VENT ROOFTOP CLEARANCE or select a topic from closely-related articles below, or see our complete INDEX to RELATED ARTICLES below. TYPE B-VENT CEILING FLOOR WALL CLEARANCES at InspectApedia.com - online encyclopedia of building & environmental inspection, testing, diagnosis, repair, & problem prevention advice. Questions & answers or comments about B-vents chimneys & flues: installation specifications. National Fuel Gas Code, an American National Standard, 4th ed. 1988 (newer edition is available) Secretariats, American Gas Association (AGA), 1515 Wilson Blvd., Arlington VA22209, and National Fire Protection Association (NFPA), Batterymarch Park, Quincy MA 02269. ANSI Z223.1-1988 - NFPA 54-1988. WARNING: be sure to check clearances and other safety guidelines in the latest edition of these standards. Fire Inspector Guidebook, A Correlation of Fire Safety Requirements Contained in the 1987 BOCA National Codes, (newer edition available), Building Officials and Code Administrators International, Inc. (BOCA), Country Club HIlls, IL 60478 312-799-2300 4th ed. Note: this document is reissued every four years. Be sure to obtain the latest edition. Uniform Mechanical Code - UMC 1991, Sec 913 (a.) Masonry Chimneys, refers to Chapters 23, 29, and 37 of the Building Code. "Rooftop View Turns to Darkness," Martine Costello, Josh Kovner, New Haven Register, 12 May 1992 p. 11: Catherine Murphy was sunning on a building roof when a chimney collapsed; she fell into and was trapped inside the chimney until rescued by emergency workers. "Chimneys and Vents," Mark J. Reinmiller, P.E., ASHI Technical Journal, Vol. 1 No. 2 July 1991 p. 34-38. "Chimney Inspection Procedures & Codes," Donald V. Cohen was to be published in the first volume of the 1994 ASHI Technical Journal by D. Friedman, then editor/publisher of that publication. The production of the ASHI Technical Journal and future editions was cancelled by ASHI President Patrick Porzio. Some of the content of Mr. Cohen's original submission has been included in this more complete chimney inspection article: InspectAPedia.com/chimneys/Chimney_Inspection_Repair.php. Copies of earlier editions of the ASHI Technical Journal are available from ASHI, the American Society of Home Inspectors. 6801.11 Multiple-Appliance Venting Systems. Two or more listed and labeled fossil fuel-fired appliances shall not be connected to a common natural draft venting system unless permitted per applicable requirements of 248 CMR or 527 CMR. For solid fuel-burning appliances, see 780 CMR 6801.12. Ceramic Roofware, Hans Van Lemmen, Shire Library, 2008, ISBN-13: 978-0747805694 - Brick chimneys, chimney-pots and roof and ridge tiles have been a feature of the roofs of a wide range of buildings since the late Middle Ages. In the first instance this ceramic roofware was functional - to make the roof weatherproof and to provide an outlet for smoke - but it could also be very decorative. The practical and ornamental aspects of ceramic roofware can still be seen throughout Britain, particularly on buildings of the Victorian and Edwardian periods. Not only do these often have ornate chimneys and roof tiles but they may also feature ornamental sculptures or highly decorative gable ends. This book charts the history of ceramic roofware from the Middle Ages to the present day, highlighting both practical and decorative applications, and giving information about manufacturers and on the styles and techniques of production and decoration. Hans van Lemmen is an established author on the history of tiles and has lectured on the subject in Britain and elsewhere. He is founder member and presently publications editor of the British Tiles and Architectural Ceramics Society. Available at the InspectAPedia Bookstore. Chimney & Stack Inspection Guidelines, American Society of Civil Engineers, 2003 - These guidelines address the inspection of chimneys and stacks. Each guideline assists owners in determining what level of inspection is appropriate to a particular chimney and provides common criteria so that all parties involved have a clear understanding of the scope of the inspection and the end product required. Each chimney or stack is a unique structure, subject to both aggressive operating and natural environments, and degradation over time. Such degradation may be managed via a prudent inspection program followed by maintenance work on any equipment or structure determined to be in need of attention. Sample inspection report specifications, sample field inspection data forms, and an example of a developed plan of a concrete chimney are included in the guidelines. This book provides a valuable guidance tool for chimney and stack inspections and also offers a set of references for these particular inspections.